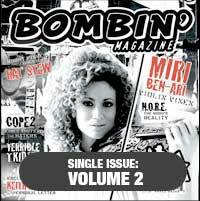 From young phenom to an established player, BOMBIN' goes balls out on this full-length magazine. Still keeping the rawest picture collection that will make your girl moist, it now adds some serious interviews, stories, and discussions of the New York crime community. COPE2 blasts off at the haters. Terrible TKID 170 hints that a legend of the game might be a snitch (find out who) and BACKFAT takes shots at EARSNOT. NORE and MIRI BEN ARI discuss music while Syentific Skate and the Phantom Rider keep it gutter for all our extreme sport heads. Full of exclusive pics, toys, limited edition sneakers, skateboards and the toughest new gear, and the real life stories of America's top street artists. 128 pages.